MY FACE I DID NOT SHIELD FROM BUFFETS AND SPITTING - This Sunday begins our Easter Week as we walk with Jesus on his final journey into Jerusalem, to his death and as we Christians know, his glorious resurrection on Easter Sunday. 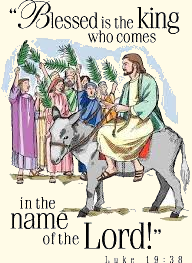 On this Palm Sunday, we begin our liturgy with a triumphant procession into the Church with trumpets boldly proclaiming the Messiah, just as they did that Palm Sunday two thousand years ago. Only this is a different kind of King, humbly riding on the back of a donkey. As our Scripture readings continue, we recall Isaiah's prophesy of the suffering servant, persecuted for his righteousness, yet he does not flinch. Our Epistle reading continues to emphasize the humility of our God, meekly coming in human form. Our Gospel reading is the Passion of Our Lord according to Saint Luke wherein Isaiah's prophesy comes into fulfillment. In our first reading (Isaiah 50:4-7), we hear part of Isaiah's lament which so fittingly foretells the passion that the Christ will endure. "The Lord GOD has given me a well-trained tongue, that I might know how to speak to the weary a word that will rouse them. Morning after morning he opens my ear that I may hear; and I have not rebelled, have not turned back. I gave my back to those who beat me, my cheeks to those who plucked my beard; my face I did not shield from buffets and spitting. The Lord GOD is my help, therefore I am not disgraced; I have set my face like flint, knowing that I shall not be put to shame." In our Epistle reading (Philippians 2:6-11), St. Paul reminds us of the humility of Jesus, the meek and humble "new Adam", who is so much different than the first Adam, who's pride led to our great fall. "Christ Jesus, though he was in the form of God, did not regard equality with God something to be grasped. Rather, he emptied himself, taking the form of a slave, coming in human likeness; and found human in appearance, he humbled himself, becoming obedient to the point of death, even death on a cross. Because of this, God greatly exalted him and bestowed on him the name which is above every name, that at the name of Jesus every knee should bend, of those in heaven and on earth and under the earth, and every tongue confess that Jesus Christ is Lord, to the glory of God the Father." Our Gospel reading (Luke 22:14 - 23:56) is St. Luke's account of the passion and death of our Lord, Jesus Christ. We urge you to take the time in prayer to read this account beforeattending Mass so that you may more fully enter into our Lord's passion account. May we not pass by this opportunity to reflect deeply on this mystery of God's salvation gift to his beloved.